We interviewed Jess Curtis, the designer of the set and costumes for #MadeByStoryhouse’s The Crucible. Tell us about your inspirations for the costume and set design for The Crucible. Of all the imagery that we looked at together, the things that really influenced the set were images of old farm buildings from Massachusetts. They are timeless bits of architecture that have essentially not changed, and so remind us of the hard work of farmers trying to survive on that land. They are beautiful in the way they decay into the landscape and they are basic and sometimes brutal in the way they shelter us from the outside but also keep us in. The clothes are my version of what the people of Salem might have worn. Like the barn, we wanted to find clothes that evoked the hard, practical lives the people lead, as well as their piety and the repression – mostly of women’s spirits and bodies – of a Puritanical society. Therefore, the fabrics are homespun but robust, there is sweat and dirt, and skin and hair are covered up. These were the main things we wanted to communicate for this community, rather than being slightly distanced from our own time as an audience by an accurate period interpretation. We also thought a lot about the movement and the act of dressing worked together. That inspired the apron like ties at the back of the dresses the women wear which allow us an action that ties the women in – laces them up – as they return to decorum and propriety. How did you prepare to take on such an iconic play? I read it a lot, even though I knew it quite well, and I researched the context, which is very rich and important in the case of this play. I also looked at Nicholas Hytner’s film as I thought that would be a common point of reference for a lot of our audience, but not until I had gathered my own visual responses to it and started to talk to [Director] Gerrie. We exchanged lots of pictures, mostly about atmospheres and the type of feeling we wanted the piece to have. This is a process that builds up layers to make the final image and continues all the way through the rehearsal process and into the theatre. How have you worked/acknowledged with the traditional and recognisable The Crucible motifs (the bonnets, etc)? 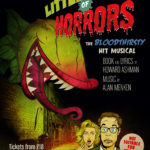 Early on, we made the decision not to be too strict with setting this production in it’s period in terms of set and costume. This meant that we could release our imaginations a little and explore some ideas that make sense of the parallels between then and now. There are aspects that are still very recognisably part of the visual and historical legacy of the play: the clerics and judges are in black, which is still the colour of the majority of church clothing in many Protestant faiths. The female characters are still wearing head coverings, and they cover their skin – another hallmark of a lot of modest religious dress for women. We looked at a lot of different shapes of head coverings, wraps and bonnets, and settled on something very close to the original 17th century coif. It frames the face, covers the hair, and is the simplest version to put on. It has a clarity of association, not only through previous productions of The Crucible but also because of other stories, more familiar to a modern audience, like The Handmaid’s Tale. How have you worked with the existing features of the theatre to create a set for The Crucible? For this production we have concentrated all our energy into Storyhouse’s thrust stage. This is a story that largely happens inside, in claustrophobic and intense spaces, almost made worse by a sense of what is happening in the space beyond: dancing, praying, interrogation, hangings. One of the meanings of the word ‘crucible’ is a melting pot in which things combine and come together at a high temperature. The thrust stage, for us, is the focal point where people are put under this kind of pressure. The set has a big barn wall which shuts us in and shuts nameless fears out. It forces us to tell the story in small, constrained spaces surrounded by witnesses (the audience). We make a contract with them to imagine the space changing when we introduce new objects or rearrange the ones we have, but we essentially never leave this space. Then, when a door does open to another space, especially to the outside world, it gives that moment power. 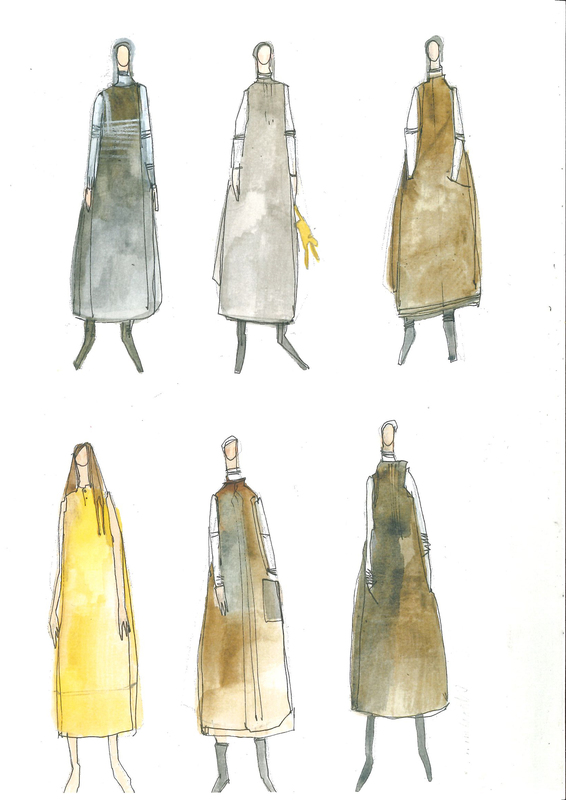 Jess’s design illustrations for The Crucible.